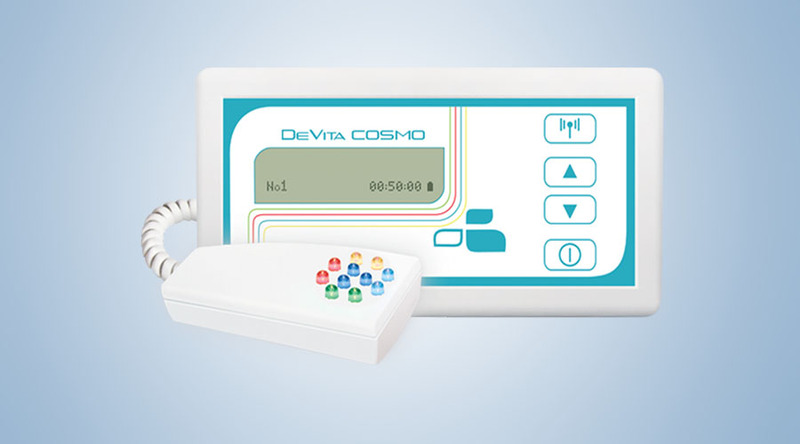 DEVITA COSMO 20 is the new generation anti-ageing device that was released in June 2014 and contains 20 pre-installed programmes. The older version DETA COSMO had 15 programmes and was the first device of the company Deta Elis that was designed to deal with cosmetology and anti-ageing. However, not only does the DEVITA COSMO heal the skin and iron out wrinkles, but it is considered as a sophisticated anti-ageing device. For preventive measures, the COSMO is recommended to be used from early ages of 18 – 25 years old, at least once a week. After the age of 25 years, the DEVITA COSMO can be used more regularly every 2-3 times weekly. This will help your skin to remain supple and soft and maintain its elasticity. 1. Set the DEVITA COSMO device to the desired program. 2. Switch on the DEVITA COSMO to execute the program. 3. Place the quantum light of the DEVITA COSMO on the correspondent areas of the face that correspond to organ systems. 4. The quantum light remains about 1 cm from the skin until you feel a comfortable heat and is rotated slowly about one rotation per second. 5. If there are several areas to cover on the face, then make 3 – 4 circular motions on one area, then move on to another area, then return back to the first area – keep repeating the cycle until the programme ends. The skin can be considered a reflection of deeper health issues in a person. 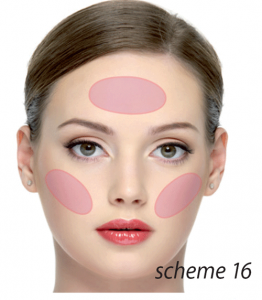 A dry, tired-looking and irritated skin shows that something in the person is imbalanced or not functioning well. The DEVITA COSMO was designed to help the skin recuperate its natural elasticity and vitality using Quantum light as well as electromagnetic therapy. No more need for toxic botox injections to iron out wrinkles – the DEVITA COSMO can do this without any side effects and is far more cost-effective. In order to further optimize skin care, with astounding results for eradicating even deep wrinkles permanently. The DEVITA COSMO can do this without any side effects and is far more cost-effective than more traditional methods of beautifying yourself. But it goes far beyond the wrinkles – it is actually a sophisticated anti-ageing device that helps to rejuvenate and balance vital organ systems that are known to lead to premature ageing when they are imbalanced. All these programmes are pre-installed and ready to go.So you can see how powerful this little device is – the 20 pre-installed therapy programmes cover a large array of physiological systems, therefore allowing the body to heal on many levels, as well as to help beautify the face and body.When you receive the device it will be in Russian, but if you hold the up and down scroll keys down together at the same time, it will change languages – English is one of them. The Electromagnetic mode is used with the Antenna which is installed inside the unit itself – this is simply placed on the body, preferably on the organ being treated, but otherwise anywhere on the body that is convenient. This programme helps to eliminate wrinkles – you simply follow the lines of the face using the Quantum light, as indicated below – these correspond to the lines of the muscle layers of the face. The device itself can be placed on any part of the body, but the chest or abdomen is fine, with the screen facing upwards as the antenna is at the back of the device. The body will also be getting the benefit of the electromagnetic waves emanating from the device, concomitantly with the Quantum light working on the face. This programme helps to eliminate tiredness and facilitates in skin relaxation; it also stimulates, revives, and slows down the natural ageing process, while improving the metabolism. The placement of the device itself on the body is not really import – you can place it anywhere that is convenient. Move the light from the top of the ear to the bottom part slowly. Repeat this movement four times in each ear. Keep using this movement while changing ears until the end of the programme. Our body produces more than 100 hormones that play an important role in all body functions such as growth, reproduction, digestion, stress control and more. Hormones are substances that are produced in the endocrine glands such as the pituitary, the thyroid and the ovaries, which are then transported by the blood to stimulate various organs and physiological systems. Any abnormal increase or decrease of these hormones can lead to a number of symptoms and pathology such as: exhaustion, stress, weak immunity, weight increase, sterility and skin problems. The skin is a receptor of a number of hormones and can also metabolize certain hormones. Acne in women usually has a hormonal cause due to the hormonal fluctuations that are common in a woman’s life. This can lead to the sebaceous glands on the skin over-secreting, leading to a very oily skin. Stress can also imbalance hormonal levels. Place the device two fingers above from the navel in the area of the solar plexus. Use the quantum light on the areas of the skin illustrated in the diagram below – the upper lip area and the areas adjacent to the chin. Use slow circular movements, moving clockwise. The patient should feel a slight warmth or tingling on the skin that is not uncomfortable. Use the programme once weekly for prevention and daily if required for treating hormonal imbalances it can be used any time of the day. Avoid using during pregnancy. The hormonal system of middle aged men is prone to imbalances that may lead to blotches and dryness of the skin. Place the device at the point of the solar plexus, two fingers above the navel. Use the Quantum light on the areas of the skin just below the lower lip as illustrated below. Use, slow clockwise circular movements on both sides of the face. For prevention use the program once a week, but for treating hormonal imbalances in men the programme can be used daily at any time of the day. This programme helps to regulate the function of the liver and it helps in alleviation of thread veins on the skin which can be caused by liver imbalances. 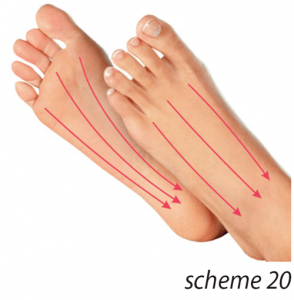 These thread veins can be located on the legs, thighs and face and can appear unsightly and displeasing. Place the appliance on the liver region on the right side of the body under the lowest rib. 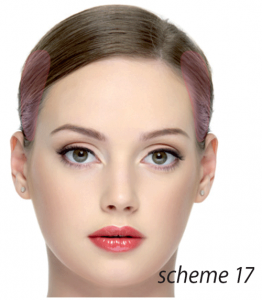 Use the Quantum light on the areas of the face as illustrated below – forehead area above the eyebrows and both sides of the face along the chin bone just below the ears. Use slow, clockwise circular movements and change from one side of the face to the other until the end of the programme time. The eyes should remain closed throughout the treatments. This programme helps to balance the Autonomic Nervous System, balancing the sympathetic and parasympathetic nervous system. Seat comfortably in a quiet room and use the Quantum light in small, clockwise circular movements on the forehead as illustrated below – note that this is high on the forehead just under the hair line. The eyes should remain closed. As the autonomic nervous system balances, the patient will feel a sense of calm and relaxation. This programme will help to calm the stomach as well as helping balance normal physiological functioning. Place the appliance on the stomach. Use the Quantum light in small, clockwise circular movements in the areas illustrated below – forehead just above the eyebrows, upper lip area, and the sides of the lips on both sides. The eyes should remain closed. This programme helps to balance the digestive processes of the gastrointestinal tract, making them more efficient. A sluggish digestive system can be a major reason for premature ageing and wrinkles. Place the appliance near the stomach. Use the Quantum light in small, clockwise circular movements in the areas illustrated below – middle of forehead, lower lip, side of lips on both sides of face. Use four circular movements in each area illustrated and continue circulating between the areas until the completion of the programme. The eyes should remain closed. This programme will help people that are chronically constipated. Chronic constipation makes the skin pale or yellowish – it loses its elasticity, and becomes flabby. Place the device near in the stomach. Use the Quantum light with small, clockwise circular movements on the areas of the face illustrated below – two areas of the forehead high on the hairline parallel with the eyebrows. Use four circular movements on each area and move to the other side and repeat until the end of the programme. The eyes should remain closed. Swollen and darkened areas under the eyes with oedema is usually a sign of kidney malfunction. Place the device on the back near in the kidneys. Use the Quantum light in the areas illustrated below – under both eyes and the areas in the middle of both ears – use four small, clockwise circular movements and move onto the next point, repeating the cycle until the programme ends. The eyes should remain closed. Many hormonal problems are reflected in the skin. These can include thyroid disorders, diabetes, polycystic ovary syndrome and hormonal changes during menopause – these are all very commonly diagnosed. Hypothyroidism, for example, makes the skin cold and dry, with brittle nails and decreased sweating. On the contrary, with hyperthyroidism the skin is hot, humid, with intensive perspiration, while the hair become thin and fragile and the nails begin peeling. You may place the device anywhere on the body – use the Quantum light in small, clockwise movements on the areas of the neck shown in the diagram below. Use the light for about 30 seconds either side and alternate until the completion of the programme. The skin can also present cyanosis, that is to say acquire a blue nuance. This colour implies that the blood is not oxygenated sufficiently, which can be a result of breakage of capillary networks, anaemias and pneumopathologies, as well as cardiac or circulatory insufficiency (regional cyanosis). Place the device on the region near in the heart. Use the Quantum light on the area of the face as illustrated below on the left side of the cheek bone, just underneath the left eye. One of the major functions of the spleen is to filter the blood of old and dying red blood cells. Although the spleen acts as a reservoir of special type of white blood cells called monocytes in humans, in animals this is not so. The monocytes stored in the spleen migrate to the injury sites and transform into dentritic cells and macrophages that may help in healing wounds and injuries. In humans, the spleen also stores platelets that normally help in blood coagulation and clotting. In animals the spleen acts as a reservoir of blood cells. This programme helps to balance any weaknesses of the spleen. Place the device in the region of the body near in the spleen (is found in the abdomen, on the right side of the body, between the 9th and 12th vertebrate). Use the Quantum light in small, clockwise circular movements on the area of the face illustrated below – on the left temple adjacent to the left eye. Use until the end of the programme. depends on the health of this gland. As the pancreas declines and degenerates, so does the body, ageing faster and faster. Place the appliance in the region near in the pancreas. The application of element with the light becomes in the advisable regions (cf. picture) with circular movements. Realise four circular movements in a advisable region (cf. picture) and afterwards are transported in next, repeating the process up to the completion of program. This programme relieves spasms of small blood vessels in eye muscles, restores the normal functioning of the muscle which controls the eye-lens, therefore improving eyesight with a good success rate. use the Quantum light on the face as illustrated below – the sides of the upper cheeks next to the eyes on both sides of the face. Make small, clockwise circular movements on both sides of the face until the programme finishes. Focus on the small round mark on the glass window during the treatment – keep your distance so that the eyes do not tire. Focus on the spot for 8 – 10 seconds then look away into the distance through the glass. Continue this exercise until you feel your eyes getting tired, then stop the exercise and simply carry on using the Quantum light until the programme finishes. After completing the treatment, allow the eyes to rest for 20 – 30 minutes in order to adapt and maintain flexibility. 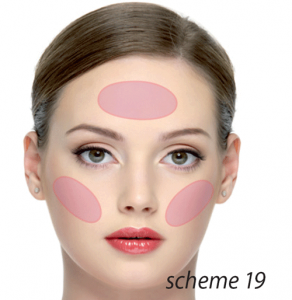 Beautiful smooth complexion and glowing skin without pimples and acne is the main goal of every woman. As most women know, using minimum makeup and looking good is not an easy task. This programme will help to remove inflammation from the face and therefore optimize complexion. Place the device at a distance of 25-30 cm from the face. Using the Quantum light, make small circular motions first on the forehead then the two cheeks. Keep repeating the cycle till the programme ends. For preventive purposes use the program every other day. If necessary you can use it for 3-4 consecutive days, then break for 3-4 days and then repeat the session for a total of 10 sessions. Daily hair loss up to 100 hairs is considered normal. However, when more hair is lost then this indicates some functional disturbance in the body. Place the device in front of the face or in the area around the eyes. Use the Quantum light on the sides of the head as indicated in the diagram below. Make 4 circular motions on one area, then move on to the other, repeating the cycle till the programme completes. Avoiding toxins and getting good amounts of sleep are important factors. The health of the nails is a reflection of overall health. Place the antenna device at a distance of about 20 cm from the treated hand. 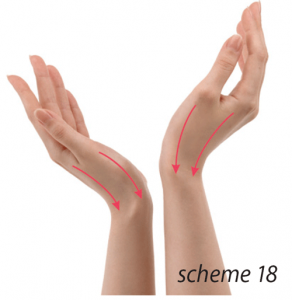 Using the Quantum light, make linear slow movements from the base of the hand (wrist joint) to the tip of each finger. First, on the back side, then on the palm. Repeat the procedure with the other hand. Repeat the cycle till the end of the program. Skin cells are constantly being regenerated, however, oﬅen skin cannot look its best due to old dead cells on the surface of the skin. Regular use of this programme will help to avoid this from occurring. Place the device at a distance of 25-30 cm from the face. Using the Quantum light on the areas of the face shown in the diagram below, make slow circular motions first on the forehead, then the cheeks, then the stomach. Repeat the cycle till the end of the program. For preventive purposes use the program every other day. If necessary you can use it 3-4 days consecutively, then take a break for 3-4 days and repeat the session. A total of 10 sessions will be required. Warning! Bioresonance devices are contraindicated for use by women of the first trimester of pregnancy and people after organs’ transplantation. It is also recommended not to use it during the first two months after myocardial infarction. In case of severe heart disease it is necessary to place the device not closer than 0.5 metre from the body. HOW CAN WE TELL THE HEALTH OF THE PERSON FROM THE FACE? 1. The elasticity of the skin is a sign of good health, whereas a relaxed tired skin is a sign of premature ageing which may be a consequence of altered metabolism and gastrointestinal problems. 3. A swollen chin and neck below the chin usually is an indication of kidney problems. 4. Skin that is folded and haggard on the cheek areas is usually an indication of stomach and pancreas health issues.